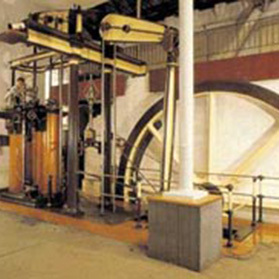 This beam engine differs from the large Cornish beam engines in having one end of the beam connected to a crank to produce rotary motion. While it made the engine simpler to operate and maintain, the main drawback of this type of engine was that it was relatively expensive to install, requiring more engine parts and heavier foundations. It was popular for use in small, rural waterworks, where the huge capacity of a Cornish engine was not required. Rotative beam engines were also extensively used to drive mill and factory machinery. This engine was built by Easton & Amos of Southwark, in 1863 and came to Kew Bridge from the Cliftonville Pumping Station in Northampton as a “kit of parts”, where it had been in storage. It is a Woolf compound engine, with the high pressure cylinder closer to the centre of the beam than the low pressure, thus resulting in differing stroke lengths. The engine drove a set of three-throw pumps from an extension to the crank shaft, which originally passed through an outside wall. Power Rating 60 horse power at 18 r.p.m.